"Our goal as socialists is to abolish private ownership of the means of production." In his 1995 autobiography Dreams From My Father, Obama makes an apparent reference to DSA, revealing that during his student years at New York’s Columbia University he “went to socialist conferences at Cooper Union,” a privately funded college for the advancement of science and art. From the early 1980s until 2004, Cooper Union had served as the usual venue of the annual Socialist Scholars Conference. 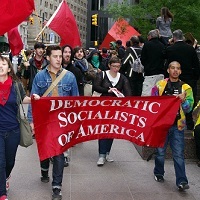 DSA describes itself as the largest socialist organization in the United States and the principal U.S. affiliate of the Socialist International. The Socialist International (SI) has what is called “consultative status” with the United Nations. Obama’s socialist backing goes back at least to 1996, when he received the endorsement of the Chicago branch of the Democratic Socialists of America (DSA) for an Illinois state senate seat.